Gautam Buddha International Cricket Stadium will have been made in Chitwan, which is being made by Humor artist Sitaram Kattel and Kunjana Ghimire's Dhurmus-Suntali Foundation. Foundation said that Gautam Buddha International Cricket Stadium will be constructed at Bharatpur Chitwan. The country's first international standard stadium will be built in multipurpose and unique design, according to the Foundation. The stadium is designed for other games along with Cricket, which will be made by collecting public support (donations). Gautam Buddha International Cricket Stadium will be constructed in the land provided by Bharatpur Metropolitan. The Foundation signed on the agreement with Metropolitan. The suggestions and good wishes here by our campaigns for Nepalese sports development have also been very encouraging. 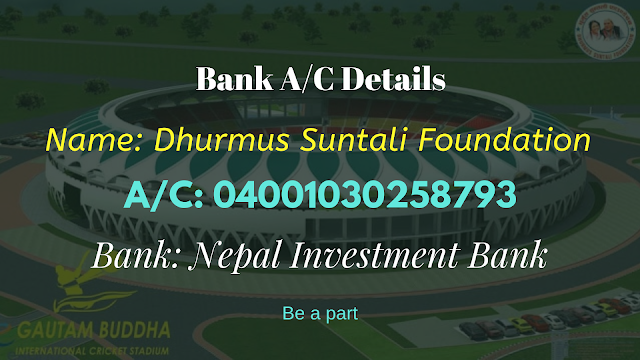 To assist (donate) for the construction of Gautam Buddha International Stadium, built by the Dhurmus Suntali Foundation, foundation requested to deposit at the account of Dhurmus Suntali Foundation in Nepal Investment Bank A/C 04001030258753 or Contact at Contact No. 014482971, 9841229912. Please note that after sending deposits, contact the foundation on their Official Facebook page with the sender name, email or phone. Keywords: Gautam Buddha International Stadium, Dhurmus Suntali Foundation, How to Assist for Construction of Gautam Buddha International Stadium, Bank Account Details for Gautam Buddha International Cricket Stadium, Dhurmus Suntali Foundation Bank A/C Details.